Your family depends on clear, clean, quality water every day. WaterCare products ensure safe and pure water for laundry, dishes, bathing, cleaning, cooking, drinking, and daily life! Our CareSoft Series® is flexible, providing a variety of water softening solutions perfectly suited for your needs. With highly advanced technology and eco-friendly features, you will have peace of mind knowing that you're bringing the best system into your home. To learn more about our exclusive water softening systems, schedule a free estimate today! The CareSoft Elite® not only softens but is also designed to save you water and ultimately, money. The CareSoft Elite® reduces unwanted taste and odor with high-performance resin media while our patented disinfection technology monitors the system with each regeneration. It also features an advanced, innovative controller, which allows your system to be fine-tuned specifically to your water treatment needs. As an added bonus, the CareSoft Elite® system is compatible with our exclusive Water Efficient Technology, or W.E.T.™. With this feature, you can maximize system efficiency without sacrificing performance while also saving money! The CareSoft Elite® system is also compatible with our advanced WiFi technology, or Wripli®. Wripli® helps you conveniently monitor your water habits by tracking how much money you've saved, sending out salt alerts, and more! There's no need for two systems with the CareSoft Elite RC®. Its split tank technology combines high-performance media with activated carbon in one tank. This environmentally friendly design is the ideal solution to protect your household plumbing while also eliminating foul tastes and odors associated city water. The CareSoft Elite RC® delivers the clear, soft, fresh water you want and need! 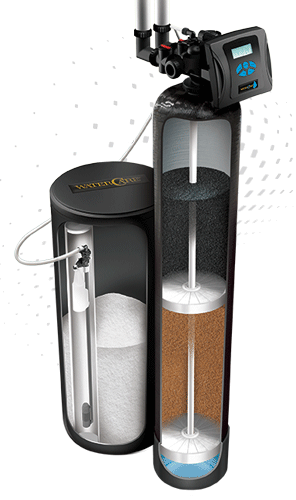 With its unique design and special features, the advanced CareSoft Elite RC® water softener can remove added disinfectants and other harmful elements in just one unit! For even more efficiency, the CareSoft Elite RC® system is also compatible with our patented Water Efficient Technology™. 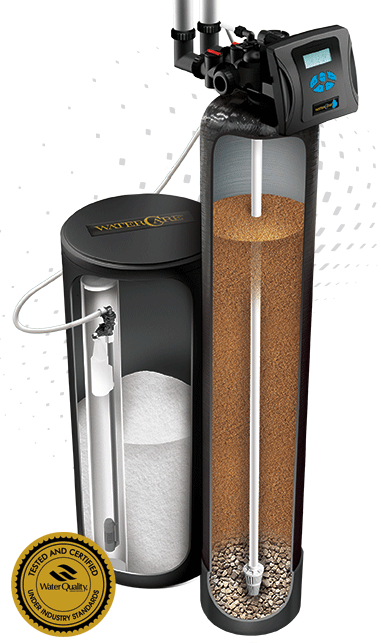 With W.E.T.™, your system will save you money on salt and water without sacrificing performance. You can also add our exclusive WiFi technology, or Wripli®, which helps you wirelessly monitor your water habits, including how much money you're saving, salt usage, and more! Unwanted minerals and hardness will be a thing of the past with the CareSoft Pro® system. It is specially designed for your lifestyle, using less water and salt but performing with maximum efficiency automatically. Featuring our patented IQ2 technology, Absolute Water Solutions will tailor your CareSoft Pro® system to effectively meet your household's specific water needs. You can also add our patented Water Efficient Technology™ to maximize the overall efficiency of your CareSoft Pro® unit. With W.E.T.™, your system will further save you money on salt and water without sacrificing performance. Great Quality Product. Minimal Maintenance needed. The CareSoft Pro RC® is an environmentally friendly solution for city water problems. Its split tank design combines two types of media in one tank. The activated carbon removes chlorine and other unwanted tastes, while the high capacity resin effectively softens your water. It's designed to deliver the quality water you want for your family. To further maximize your water softening system's performance, consider adding our patented Water Efficient Technology™. 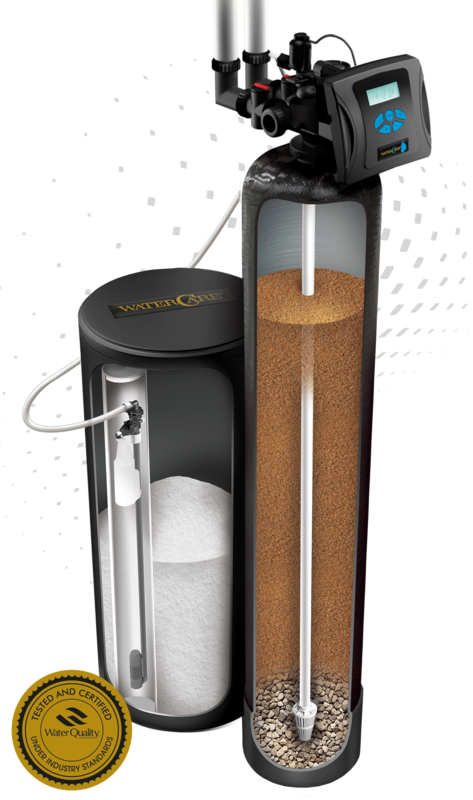 With W.E.T.™, your system will further save you money on salt and water without sacrificing performance.